Wishing a very special person a fulfilling retirement. May your new journey be filled with joy! You have worked so hard for this day to come and have done such a wonderful job. 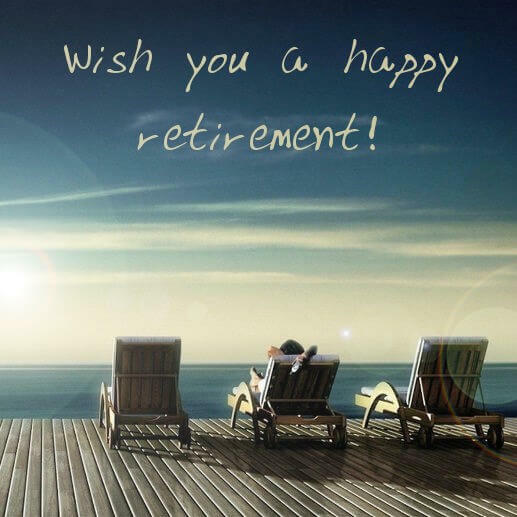 May you have a relaxing retirement, knowing that your life's work has made a difference! Thank you for all of your dedication. Now you can relax and enjoy the scenery around you! Your life's work has made a difference! Knowing that have a relaxing retirement. Retirement ads 5 days to your weekend! Enjoy it! As your career comes to an end, please know that your influence carries on. Countless lives have been impacted through the knowledge you have imparted. Wishing your retirement is everything you ever dreamed it could be. Best wishes for a fun-filled but relaxing retirement. I'll think of you often. But now forget all meetings and worries - it's your time! Thanks for making our work life much easier and funny. Now you can unwind your mind and spend some time with your family and best friends. May you get the best of everything in life. Now as you retire, we are missing our great colleague at work. Wishing you a stress-free life full of success and happiness! Some people just know how to bring out the best in others. You are this type of coworker! Thank you for everything you did. Good bye and good luck! A successful team is a group of many hands but of one mind. We were glad to work with a boss like you and wish you a happy retirement!